Here’s how you can win it. This will require a bit of “work” on your part. But I suspect only a hundred or less folks will put in an entry, so your chances of winning are extremely high. So here goes. You must hunt through Valentine’s Day posts in the archives from 2005 onwards. There are almost a dozen word clues located at the bottom of each post that you must piece together. Each clue is numbered, so you must line them up sequentially. When you have obtained all the clues, answer the question in a comment below, and that will be your entry to the “contest”. Not all Valentine’s posts have a clue, so keep looking until you get all of the clues. Use the “archives” function on the website to go through the old posts… And make sure you use an email address that works so I can reach you if you are chosen as the winner! P.S. Any reader can join this contest. The winner will be selected from the correctly done entries. If you live abroad, I can LBC your prize to a relative with a Philippine address that LBC will deliver to (I think there are remote areas of Jolo, Batanes, Palawan, etc. that they don’t cover). If you are a local, and it’s easier for you to pick up the prize from a Zubuchon restaurant then we can do that as well. Otherwise, I will LBC it to you. Thanks. PLEASE LIMIT YOUR COMMENT BELOW TO YOUR ANSWER. DO NOT POST THE QUESTIONS OR CLUES AND SPOIL THE CONTEST FOR THE REST OF THE READERS. THANKS. 163. 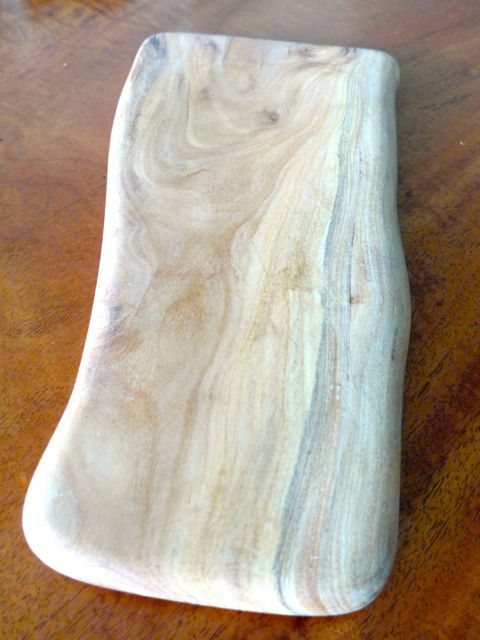 I bought a Jamie Oliver long wooden board (plank) recently to add to my collection of cheese boards and serving boards. Its dimensions are about 28x7inches. It has a nice enough length but now I find it too narrow. It seemed like a good idea at the time. Oh well. Your molave board looks really really nice. How about a slab for dining table? ???? wishful thinking. I don’t want to be greedy but how can I resist trying for such a beautiful board? My mother would love it! Btw, jams are safely packed in my suitcase all nice and protected. Thanks for the thoughtful wrapping! I was going to send a photo of me eating the chicharon. Sooooo delicious! Tuna in Olive Oil From Scratch!